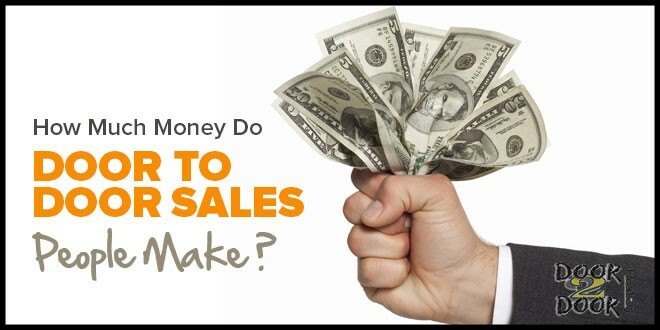 Home » Blog Posts » How Much Money Do Door To Door Sales People Make ? 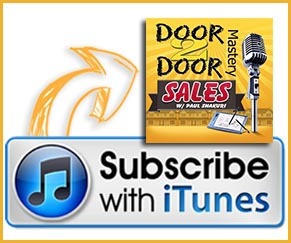 How Much Money Do Door To Door Sales People Make ? “The answer is $52,543.93.” I’m just kidding. My management team gets asked this question often. There is no way to answer it with a set number. 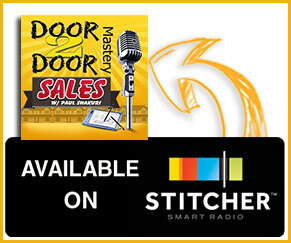 Instead, there is a range of income a Door Knocker can generate depending on their dedication and sales. This also depends on the way in which a company pays commissions. 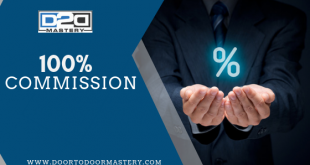 Commissions for Door to Door sales is typically set up in three ways: (1) 100% Commission, (2) Base Salary, or (3) Either Base Salary or Commissions. When a sales rep gets a sale, they get paid a set amount which is called a commission. This set amount may be a fixed number such as $5 or a percentage such as 5% of what they sell the product for. As a sales rep generates more sales, they will get paid a higher percentage per sale. There are two examples of commission based setups. First, a tier scale is when you get a certain amount of money per sale. If you get a bonus of $50 for one sale, you will get $150 bonus for three sales. If you get five sales, the company may even pay your $100 bonus for each sale on top of the original starting pay. Second, a backend setup involves a similar concept except the company determines the bonus based on a length of time. For instance, a company may only provide bonuses every four months. In four months, the company would add up the number of sales and provide a bonus in the form of one lump sum which depends on what level of tier you hit. You have the highest potential to make money with 100% commission. However, companies will pay YOU when they get paid. This can become burdensome if your customers neglect paying a company. If the company doesn’t get paid, you don’t get paid. Even though you have the highest potential of making money with companies paying you in 100% commission, this business model is extremely difficult for company owners because of overhead and future chargebacks that could arise. If you are on this set commission structure, respect the opportunity and company you work for as growth comes from participation of both the management team and the sales representatives themselves. Home Security: $150 – $700 per sale. Don’t think the higher the number means the better the company. This is not always the case and typically with higher commissions, there are higher deductions. Solar: $1,000 – $2,000 per sale. This is a longer sale. The volume is not as high as home security sales, and the work involved in generating a sale tends to be more. Building a pipeline of potential customers and turning them into customers is generally the rule of thumb. Pest Control: $50 – $200 per sale. This involves a higher volume of sales. Referrals if done right could really help your sales volume increase..
Satellite Sales: $100 – $300 per sale. The initial thought process is everyone loves entertainment right? Getting people to switch service providers is typically the challenge. The figures above are all estimates based the industry and many other contributing factors such as credit scores and what sales reps and companies give away as well as what they collect as sales upgrades. My best advice is to pick the product or service that you are most passionate about. Do your research on which company can pay you fairly, and more importantly has a good track record of making sales representatives happy. The last thing you want is to work in an environment of corruption. Never Lie, Cheat, or steal from any company or customer, or anyone in that regard. Its 100% WRONG! Also, it will get you into a ton of trouble. A salesperson will get a base salary plus commissions. Because the sales rep is earning a base salary, the commission is less than what a sales rep would earn if the company followed the 100% commission business model. A reason for this is that the company has to compensate for the salaries being paid. Some sales reps make more than others due to a combination of factors including skills, experience, and the market. The Base Salary Plus Commission setup is more stable for the salesperson because they have guaranteed income regardless of whether they make a sale or not. Furthermore, it works great for the company if the sales person produces high volume. For instance, a lot of water companies selling bottled water utilize this type of model because they want to give the sales rep an incentive to push for extra accounts. The water companies earn residual income because of repeat orders. This enables the water companies to pay salaries to the sales reps because they do not have to rely on new sales because they already have income coming in each month from the residual income. The only problem with this setup is the company bears the liability if the seller doesn’t sell. As such, some money could be lost to salaries for sales reps that are not generating new sales. As a result, the commission is lower for those who do generate sales to make up for those who are not generating sales. This setup works well with some industries. For example, in the home security industry, a base salary plus commission works well because the security systems are given away to customers and the homeowner only has to pay a flat fee every month. For instance, they may only need to pay $44.95/ month. In conclusion, this is a great setup if you are a new sales rep with little or no experience. On the other hand, if you are confident and have experience, you should look for a company with a different setup. Some companies will pay sales rep a base salary or commission. This type of setup means a sales person is guaranteed a minimum base salary. However, if the commission equals more than their base salary, they will only get their commission. Keep in mind with this setup that the salesperson does not get both the commission and base pay on any given check. Example: If the base pay was $1,000 a week and the seller’s commission for that week equaled $600, the sales rep would only get the $1,000 base pay. The salesperson would not get any commission. Rather, the company gets to keep the commission to offset the base pay. There is nothing wrong with this setup. For certain people, this makes sense because they want a guaranteed salary. For sales reps who are still in the “Learning Phase,” this setup helps you because you will have income as you are learning the business. However, you must keep in mind that you will not be maximizing your earnings. Always remember that companies paying salaries cannot afford to continuously pay a salary and still offer top commission! Indeed, the commission may not be as high as a company paying 100% commission. This is indicative of very good business practice. Regardless of which path you take, understand that some people learn the business quicker than others. Once you start naturally delivering your pitch and focusing on how you’re presenting yourself, you’re going to get more comfortable at the doors. Getting comfortable is half the battle. That is why I teach you over and over in my members area all that you need to know so that you can get comfortable as quick as possible. Thereby, you can increase your odds of not quitting and not losing. By visiting my members area, you can learn the business which will enable you to choose a company that pays commissions in a way that can help you maximize your income. If you’re knocking on doors and you’re fighting to make it work, pat yourself on the back because you are a true entrepreneur in my eyes. Many people fail at being an entrepreneur. Remember this so you can succeed like I did. Previous Knocking With A Partner, Should You ?